KILLEEN, TX — A group of teens came together Sunday to clean up graffiti near a Killeen neighborhood. Off the road of a cul-de-sac on Linda Spur, vandals tagged the area over time. But dozens came together to clean up the vandalism. 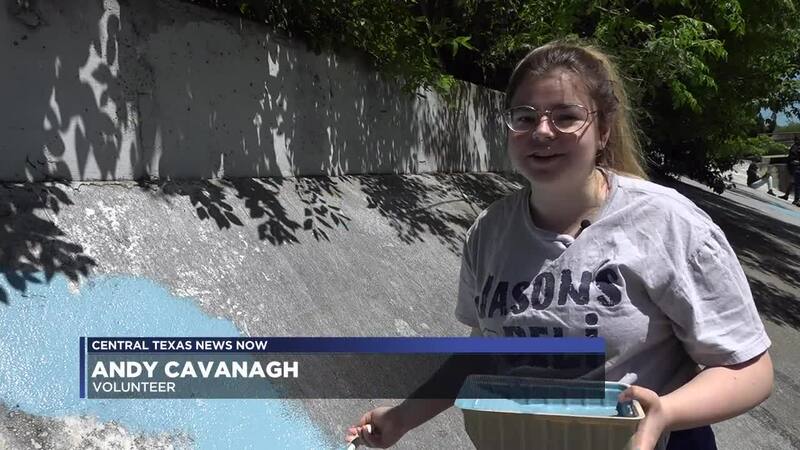 ”In Killeen, we always get a bad rap about how there is nothing to do, and there is no way to get involved and how it’s ugly, and boring, so anything we can do as the youth advisory group, anyone as youth can do to get involved, we should take that chance and that opportunity,” said Andy Cavanagh, a student volunteer. The Youth Advisory Commission approached the city’s Code Enforcemt about helping clean the graffiti. The project was made possible in part by Sherwin Williams, who donated the paint and the supplies. Graffiti can diminish property values and deter new business. It costs communities across the country an estimated $8 billion annually to clean. If caught, graffiti comes with weighty consequences. In Texas, most offenses are considered to be misdemeanors, and could cost lawbreakers a fine. However, it can be elevated to a state jail felony if vandals tag a school, place of worship or a public monument. “The city of Killeen, while it might not look like it on the surface, it’s a beautiful city. There’s nice houses, there’s parks, there’s activities, there’s just so much that we need to give back. People come and go with the army base, but people that stay here, this is our home. Our place of livelihood, the place that we work, the place that we are growing up with,” said Rodolfo Alvarez, student volunteer. With dozens of hands fast at work, the project was complete in just under an hour. The Youth Advisory Commission is designed to help instill values and make a difference in area youth. “This program gives kids a voice, it gets them involved in their community, but it also teaches them responsibility,” said Levallois Hamilton, Youth Advisory Commission leader.